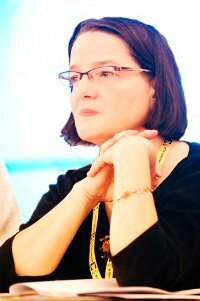 Christine Bond is the first women President of BECTU. She was elected in May 2010, and subsequently re-elected in May 2012. Christine’s aim is to work for an active and aware membership. Develop and support the Divisions and build campaigns to support our Branches. Encourage inter-Divisonal events and conferences to build an awareness of our union as a whole. Attacks on the BBC, its funding and development of it’s web based future. Reductions in commissioning budgets for productions. Attempts to develop a low pay/no pay culture in independent film. The continued casualisation of jobs and the loss of agreed benefits as members face constant change of employers. The reductions in regional news and programming. Christine said: “I am proud to be an activist in BECTU. I believe that it is our collective strength that creates the best and fairest workplace and that the union must encourage and find ways for members, new and old, to become active”.